for commercial, landlords and domestic. We specialise in renewable heating systems such as biomass boilers, ground source heat pumps, air source heat pumps and solar thermal installations, and can also fit underfloor heating systems. Our team of experienced technicians can tailor a project to suit your needs, whether it's a commercial building or a home installation. 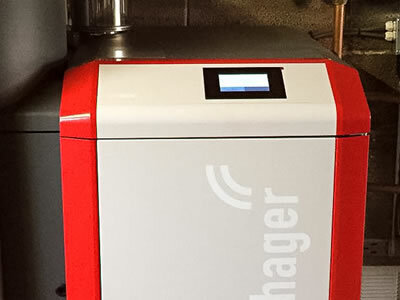 For both our commercial and domestic clients, we are experienced in the installations and servicing of Air Source Heat Pumps and Biomass boilers and are approved installers for Mitsubishi and Windhager. From small flats to large detached houses and office blocks to schools there are large or small appliances to suit your space. For more information call us on 01292 550954 or email us on [email protected]. Windhager biomass boiler showing control panel. Air source heat pumps produce three kilowatts of heat for every one kilowatt of electricity consumed. This is more than 3 times as efficent compared with traditional heating systems where for every kilowatt consumed you get less than one back. The Renewable Heat Incentive (RHI) is a long-term financial support programme for renewable heat. The scheme helps the UK meet targets to reduce fossil fuel use and combat climate change. People who join the scheme receive quarterly payments for seven years for the amount of clean, green renewable heat it’s estimated their system produces. The scheme runs in two parts, Domestic (homeowners, private landlords, social landlords and self-builders) and Non-domestic (industry, businesses and public sector organisations). The Glenkens Gazette consulted Ross about how RHI works for their Eco Feature article New government incentives for renewable heating (100kb PDF). To give you an idea of the potential savings with an air source heat pump installed in a domestic situation lets look at an average well-insulated two-bedroom semi-detached house. The cost of installing an air source heat pump is around £10,000. This can be covered by an interest free government loan. If your home runs on oil or LPG, savings per year could be around £600. If your home runs an electric heating systems the saving is even more - up to £1,500 per year. The RHI payments could be up to £2,040 per year (for the annual maximum of 20,000 kilowatt-hours) for the seven-year period the agreement runs. So over the seven year period the RHI agreement runs, this gives a potential RHI income of £14,280 and a saving on heating bills of up to £10,500. Plus ongoing savings indefinitely thereafter. For commercial installations, the RHI is set up over a 20 year period, with a lower per kilowatt-hour tariff. Contact Ross on 01292 550 954 or email [email protected] to find out more about how you could save money with an air source heat pump. RJ McCulloch are an MCS and Green Deal approved supplier and installer in South West Scotland specialising in renewable energy systems. 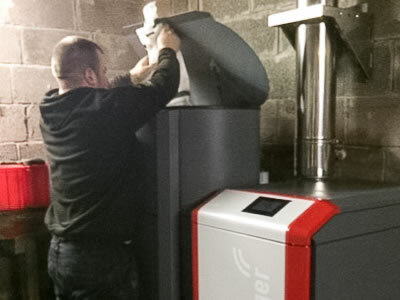 We consult on, install, service and repair renewable energy heating systems such as air source heat pumps, ground source heat pumps and biomass boilers. We also offer traditional heating and plumbing services. All content ©copyright R J McCulloch Ltd. 2019. All rights reserved.